I loved this collection of short stories. It was a birthday present from Nate who thought it was a shame I’d never read Haruki Murakami before. The writing is deceptively simple with moods that have a way of really sinking into you. Honestly, I’ve never read anything that so deftly shifts between humor and sadness. It’s easy as a reader to sympathize with (most of) these characters and the strain or strangeness of their situations. The characters I found most interesting felt isolated from their peers because of a fantastic experience or their ability to entertain impossible ideas. It’s such an unusual type of loneliness… I also loved the easy use of pop culture references and banal details of daily life- they lend a nice pragmatism to the weirdness of the stories. My favorite stories: Sleep, Barn Burning, The Dancing Dwarf, and The Elephant Vanishes. 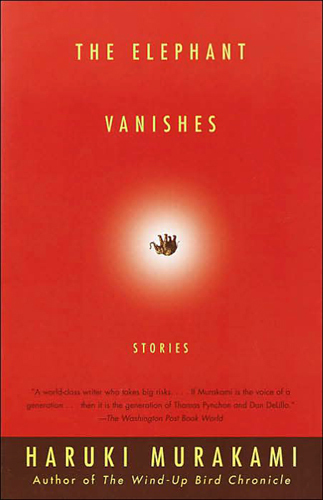 This entry was posted in books and tagged haruki murakami, the elephant vanishes. Bookmark the permalink.